Paladin Group offers merchants insight on systems, tools, strategies, vendors, and industry trends to ensure protection against fraud. Our unparalleled team bears decades of experience in the fraud prevention realm, guiding you through every step of fraud prevention with a thorough and customizable approach. Not only do we assess current risk, conduct analysis, recommend actions, and assist in implementation, but we also train our clients’ teams and provide ongoing consulting as needed. Our aim is to help our clients look and feel like heroes. Where other fraud prevention programs leave off, we carry the torch for you. We help merchants measure the right aspects of their business to uncover the source of current and potential fraud problems—and help determine how many good orders are being rejected. We keep up with the technologies in this space and help you select and utilize the best systems, platforms, and tools for your particular fraud and payments issues. We make sure you’re able to quickly and clearly tell your fraud prevention success stories to your team—and we evolve reporting as your business expands and as needs evolve. 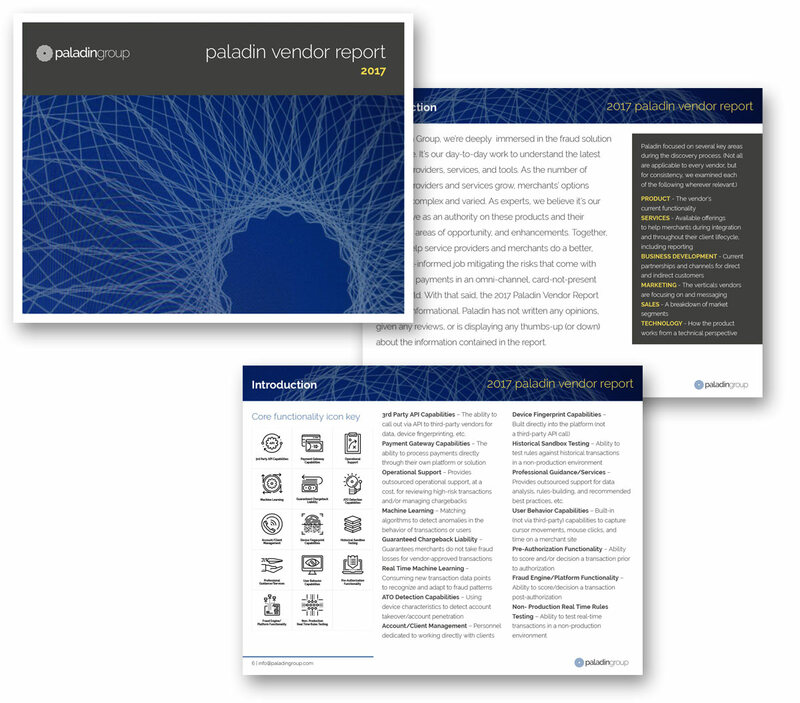 The PVR, gathered by the industry experts at Paladin, provides detailed information on over 40 vendors who offer a wide variety of different fraud prevention tools, platforms, and services. This report is designed to give you a comprehensive overview of the different products offered by each company and present analysis to help you focus on who may ultimately best align with your individual fraud prevention goals. Our end-to-end approach to fraud prevention builds lasting protection for merchants. We carefully assess current defenses, then follow through with full services like recurring analysis, reporting, and team training. Through our highly specialized expertise and a network of industry contacts, we work with vendors to assist in product development, ROI calculation, team training, and conversion sciences. I have known the founders of Paladin for over a decade, they are knowledgeable, hardworking, ethical, straight shooters that bring a wealth of fraud prevention experience to the marketplace. I would recommend partnering with them to help understand, mitigate and solve your fraud prevention problems. I met the Paladin guys over the years through the MRC and know that if I had a fraud problem, they would be the first consultants I would call.